Beautifully engraved specimen certificate from St. Louis - San Francisco Railway Company printed in 1971. This historic document was printed by American Bank Note Company and has an ornate border around it with a vignette of Mercury a woman flying with a city in the background. This item is over 35 years old. The St. Louis & San Francisco Railway was incorporated in Missouri on September 7, 1876. It was formed from the Missouri Division and Central Division of the Atlantic and Pacific Railroad. 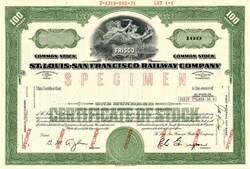 After bankruptcy, the Frisco emerged as the St. Louis and San Francisco Railroad, which was incorporated on 29 June 1896. This company, too, went bankrupt; on 24 August 1916, the company was reorganized as the St. Louis-San Francisco Railway. The St. Louis-San Francisco Railway had two main lines: St. Louis - Tulsa - Oklahoma City and Kansas City - Memphis - Birmingham. The junction of the two lines was in Springfield, Missouri. The Frisco was acquired by the Burlington Northern Railroad on November 21, 1980. History from Wikipeida and OldCompanyResearch.com.